Across the country the anti-bottled water movement is gaining momentum. Some city governments are installing water filtration systems in office buildings and reducing budgets for bottled water. San Francisco banned the use of city dollars for the purchase of bottled water and Chicago and Seattle have followed suit with their own initiatives. Chez Panisse started a trend and now Boston restaurants are following suit by serving tap water and using fountain jets to make their own club soda. This spring the Park Slope Food Co-op with over 13,000 members sold its last bottle of water. 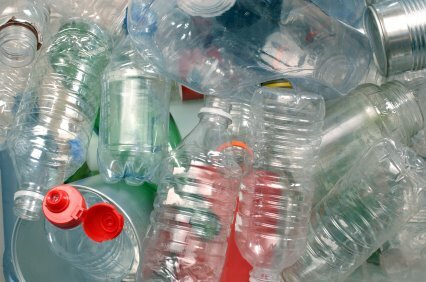 Each year more than 4 billion pounds of PET plastic bottles end up in landfills or as roadside litter. Making bottles to meet Americans’ demand for bottled water required the equivalent of more than 17 million barrels of oil last year – enough fuel for more than 1 million U.S. cars for a year - and generated more than 2.5 million tons of carbon dioxide. The entire energy costs of the lifecycle of a bottle of water is equivalent, on average, to filling up a quarter of each bottle with oil. Worldwide, consumers spent $100 billion on bottled water in 2005. 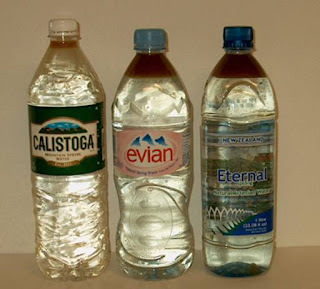 Seventy-four percent of Americans drink bottled water, and one in five drinks only bottled water. Approximately 1.5 million barrels of oil—enough to run 100,000 cars for a whole year—are used to make plastic water bottles, while transporting these bottles burns even more oil. The growth in bottled water production has increased water extraction in areas near bottling plants, leading to water shortages that affect nearby consumers and farmers. In addition to the millions of gallons of water used in the plastic-making process, two gallons of water are wasted in the purification process for every gallon that goes into the bottles. Below is an image taken by David Coale of Acterra. He calculated the amount of oil required to ship a bottle of water from its source to the Bay Area of California and poured this amount of oil into each bottle. So what am I going to do to wean myself off my bottled water addiction? Read Bottle Mania: How Water Went on Sale and Why We Bought It by Elizabeth Royte author of Garbage Land: On the Secret Trail of Trash. Take the Think Outside The Bottle Pledge. Then for portability purchase BPA free water bottles for the whole family. Gardenaut provides a comprehensive list and in depth reviews of the bottles readily available. To get my fix of bubbles this NY Times article provides or good list of options. I signed a local 'no more water bottles' petition last year. It was so easy to do. I look at those 24 case flats of bottled water at the store and just see empty plastic bottles flitting around at the dump. Not a pretty sight. I have 4 sport-type bottles that I use on a regular basis for our family of 5. Seeing that water is our favorite beverage in our household, I pretty much carry one wherever I go. The tricky part (sometimes) is not leaving it behind! I couldn't agree with you more on this topic. I wrote about it as well on my blog. People need to start realizing that very few of the plastic water bottles they drink from are not recycled. It's a choice: either preserve yourself or preserve the environment. I figure I can't preserve the environment until I take care of myself. I drink bottled water almost exclusively because I don't want to drink chlorinated tap water with fluoride added. Both are deadly, cumulative poisons. So...until I get the money and know how to install a Reverse Osmosis water filtering system, I will continue to use a well known bottled spring water and I would recommend you do as well. Tap water may seem innocuous but both chlorine and fluoride are major poisons you should avoid. I've found that by filtering my own water and putting it in eco-friendly bpa free water bottles that I can really do without the bottled water at the office. I feel like I'm setting a good example and helping the planet.